This vintage are remembered for their eclectic styling, influenced by the aircraft of the time. It is a time capsule of one of the most unique cars of the post war period. The Studebaker Champion Starlite Deluxe was a styling sensation that predicted design trends for the auto industry as a whole. With only 8,898 made; only a handful remain. When was the last time you've seen one?? This 65-year old collector's classic rides and handles great! Gets 22-25 mpg. Easy to work on. Available parts. Reliable. & FUN to drive! Great-looking frame off restoration done on this classic! Optioned With Exterior Windshield Sun Visor, Rear Fender Skirts, Heater, Clock. All New Chrome And Polished Stainless Steel, Full Factory Wheel Covers And New Radial White Wall Tires. Original front floor mat and rear seat carpeting, in Great Condition. Near perfect dash (just needs wood panel that fits around gauges, sanded, polished and reapplied). Steering wheel paint is starting to chip a little. Door panels and headliner all in great condition. Studebaker Thermo-Controlled Climatizer & original AM push button radio & factory clock (not working). Factory steel wheels, trim rings and wheel covers & Whitewall tires. Mileage unknown (first digit eligible). 4 owners since new. Garage kept, pampered and serviced. Ready to take on the road or to a show. Safe, Comfortable, Reliable, Enjoyable Driving. 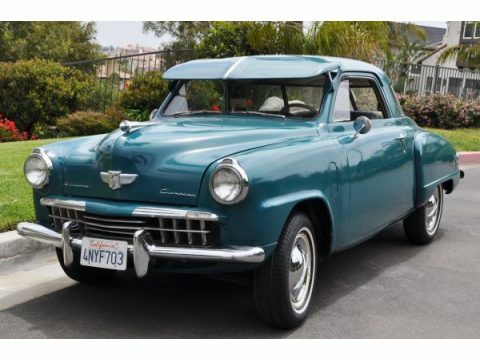 This is a fine example of Studebaker's best! Price is flexible. Qualified buyers may be eligible for Financing and Nationwide Shipping. Asking $8,400. Trades considered... ideally for a circa 1960 Plymouth Valiant or similar look (model and make) with slant 6 automatic push button transmission, or a Toyota Prius. Available for hire for photo-shoots, film and/or TV.